Whenever I’m about to start a new sculpture, picture or project, fear usually rises its ugly head and I find myself doing everything else, except what I really want to do! For several months, I had been longing to do a new bronze sculpture and it wasn’t until last November that I finally settled myself enough to sit down and start it! I wasn’t making this sculpture for a commission or an exhibition. It was an inner desire to make a new piece that was driving me. My initial feelings were a mix of excitement, overwhelm and fear. As I resisted the urge to distract myself with something else. I started to do my sketches and began to play with the materials. I let go of trying to plan too much and I just gave myself the time and space to allow what ever wanted to emerge to be free to do so! And then the following quote by Erin Hanson, came to me. An idea started to emerge about capturing that magic moment when doubt and fear lose their power and fear of failing turns into creative courage, fuelled by curiousity and faith in the unknown. 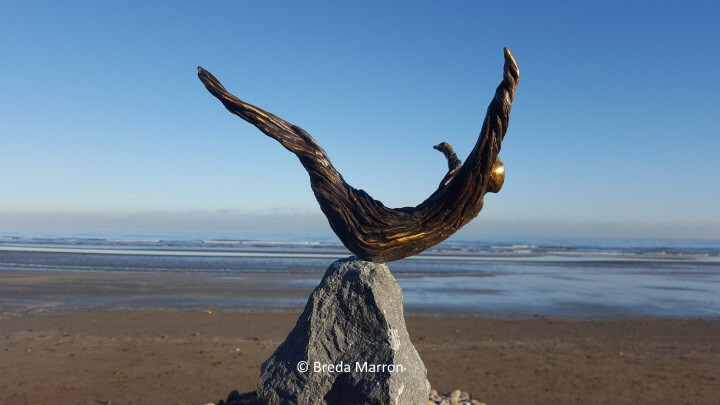 For me this sculpture is a recognition of the interconnection of fear and faith and the delicate balance and dance between both, which is part of path with every original creative piece of work. The creative process is rarely a straight and easy path but I have found curiosity and courage are the best tools to enjoying the journey.